Please note that during the faculty board meeting of 11 July 2018 internal standards during the examination phase of a doctoral project were passed. So far there ist only a German version. Therefore please contact the dean's office for details. Appointment of an examining committee during semester breaks when there are no meetings of the faculty board: If you hand in your dissertation at the doctoral examination office until 18 Febr. 2019, 18 March 2019 or 15 April 2019, the examining committee can be appointed by an electronic vote of the members of the faculty board so that your application can be processed without further delay (reports etc. ), if all members agree with the proposal about the examining committee. However, if members see the need to discuss the proposal, the examining committee will be appointed only at the next regular faculty board meeting. On 12 Dec 2018 the faculty board has decided that you don't have to meet the deadline of the examination office to hand in your application for a doctoral degree 14 work days before the faculty board meeting. Instead, the latest possible deadline to hand in your application at dean's office is Monday noon before the faculty board meeting. So for the next meeting on 23 Jan. this is 21 Jan.. Until then your complete documents (i.e. electronic and paper application plus your proposal for an examining committee) have to be at the dean's office. Therefore, the last possible appointment at the examination office for handing in your paper application is 18 Jan. 2019. Please contact the dean's office if you have questions. Please note that there is additional information available if you want to hand in a cumulative dissertation. Which Regulations apply? Please note the information on doctoral regulations. 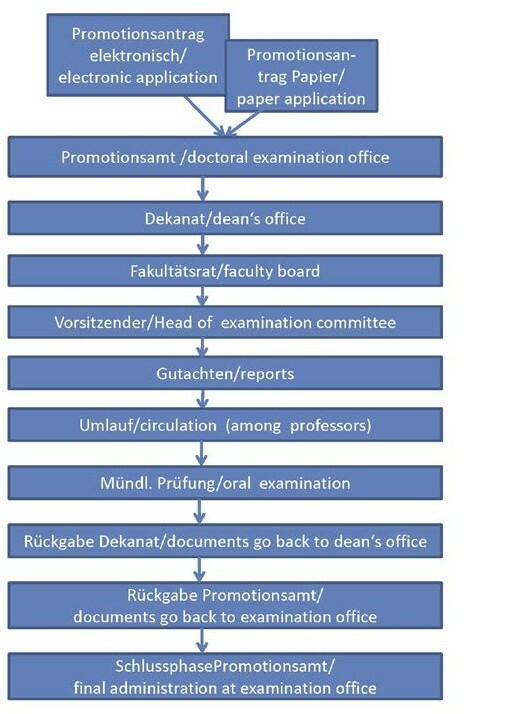 Since 2014 the administration of the doctoral examination process takes place within the document management system of the TUM Graduate School (TUM-GS), DocGS. This applies also to doctoral students who are not a member of a graduate center. In regard to this integration into DocGS there are three groups of doctoral students. To which group you belong depends on the date of the confirmation of the enrollment into the doctoral candidacy list. Please consult your supervisor for the question of when it makes sense to hand in your dissertation, because you cannot hand in your dissertation without her/his consent. On our websites you can find information about faculty boards meetings to hand in your application. You don’t need to meet the deadline of 14 days before the faculty board meeting that the doctoral examination office prescribes. However, if you hand in your dissertation at the very last moment, you run the risk that your documents will not be available for the faculty board meeting on time. In this case you will need to wait for the next meeting. For a publication based dissertation there are additional rules, described here. There are no rules concerning formal aspects of your dissertation such as type size or margin width etc. Only your title page is formalized (see below "Necessary Documents"). All other formal aspects are left to you as the author. This also applies to citation rules which vary from one scientific community to another. Please direct your questions concerning correct citations etc. to your supervisor. Please check in your TUM-GS-Account if you have fulfilled the qualification program of your graduate center (e.g. ISAM, Topmath, Helena) and upload the necessary documents. Otherwise the application for a doctoral degree remains invisible. Please note that although you will receive support from the department during your examination phase, the responsibility for the overall coordination remains with you. As a result you need to proactively search for answers to your questions. 1. Registration onto the doctoral list: You have to be registered on the doctoral list - either via doc-gs or without - of the department where you want to hand in your dissertation. 2. Recognition of a foreign degree: If you have a foreign degree you need to go through a recognition procedure, where in the end TUM confirms that your Master is equivalent to a Master of TUM. This also applies for Austrian and Swiss Masters. The letter of confirmation is needed. 3. Requirements of your graduate center have to be fulfilled: If you are a memberof a graduate center – either voluntary (Group 2) or obligatory (Group 1), the program you defined in your supervision agreement needs to be fulfilled. Persons belonging to group 3 have no obligations. You need to prepare a CV in German that will later be used for the circulation of your thesis among the professors of the department. Therefore you might want to restrict yourself to your educational biography starting with a high school diploma, leaving out personal data such as private contact data etc. The Master's certificate or university diploma and transcript that you upload have to be certified by the issuing university or by public authorities. Master's certificates, diplomas and transcripts issued by TUM are accepted without certification. In this case you need to bring the original documents with you to your appointment at the doctoral examination office. Doctoral students of group 1 have already uploaded these documents, so they will not appear in your list of required documents. If you have received a recognition of a foreign degree, please upload this and leave the slots for diploma and transcript empty. 5 identical paper copies of your dissertation are necessary. These copies are called "Vorabexemplare", because you hand them in before your oral examination. Title page for Vorabexemplare: This sample can be filled in by a pdf-writer or you can produce a doc- or latex-file that looks similar. The TUM-Logo is not necessary for these copies. Please leave the bottom of the page and the space for the examining committee empty. You will receive the final title page only after your oral examination. This is for reasons of protection against forgery. 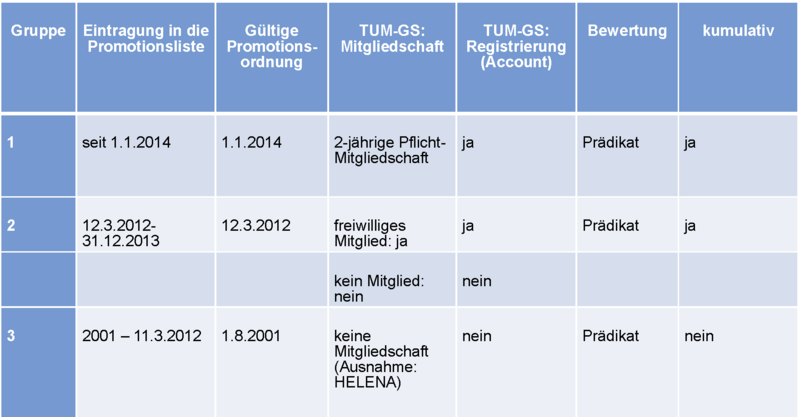 If you don't have a job contract with TUM (Helmholtz, MPI etc.) an official certificate of good conduct (Führungszeugnis) is still valid on the day you hand in your documents at the examination office.You have to apply for a certificate of good conduct at your municipal government. Please ask for a certificate from one public authority to another (von Behörde an Behörde). It needs to be sent by paper to TUM, Studenten Service Zentrum, Promotionsamt, Arcisstr. 21, 80333 München. It will arrive there within 2 or 3 weeks and is valid for 3 months. If it is expired you will have to apply for a new one. You need to prepare a list of prior publications of parts of your dissertation: In the conventional (not publication based) dissertation you include your own publications in your list of publications at the end of your dissertation. Additionally, if you have prior publications of parts of your dissertation you need to list them separately as one of the documents of your application for a doctoral degree to hand in at the examination office. You can list your publications with the status they have on the day you write the list (e.g. in review, accepted, in print, to appear, etc.). You don’t have to update this document when the status changes. This document is important for legal reasons and remains with your application papers. The list includes only publications of parts of your dissertation. If you have publications that are not part of your dissertation's research project you don’t include them in this list. When you are in doubt, it’s better to include the publication, as this has no disadvantages for you. The Affidavit can be printed and filled in by hand. For registering your dissertation topic, please follow the instructions until you are able to produce a printout which your supervisor needs to sign. This is the only time during your application that you will need her or his signature. What is the difference between examiner and reviewer? Strictly speaking, an examiner is a person who writes a review of your thesis and takes part in your oral examination. A person who writes a review but will not take part in your oral examination is a reviewer. Even if, in everyday language, those terms are usually used synonymously, examiner is the overall term. Who can be examiner in a doctoral examination? Examiners need to be "Hochschullehrer" (university teachers) in accordance with the Bayerisches Hochschulgesetz, i.e. they need an academic title equivalent to PD or Professor. The best way to prove that they have this title is a website with the title on it. In an international context the titles of "reader" and "lecturer" are the only exceptions that are accepted so far. TUM Junior Fellows are also eligible as primary examiners for their own employees and as examiners in doctoral examinations. For more details, please consult the Regulations for the Award of doctoral Degrees at TUM, section 10.
Who can NOT be an examiner in a doctoral examination? Leading researchers without an affiliation to a university are not "Hochschullehrer" in the mentioned sense and therefore cannot be examiners. The affiliation is made visible by the website of a university which lists him/her as a member. Even high ranking researchers need to meet this requirement. How many members of the examining committee are necessary? Chair of the committee needs to be an active professor from the department of mathematics; retired professors are excluded. 1st examiner is your supervisor (no exceptions). 2nd examiner is an eligible member from the department of mathematics, of TUM or from a German or international university. The function of the 2nd examiner can be shared by two persons: one person writes a review and a second person takes part in the oral examination. In this case both persons have to meet the requirement of being "Hochschulllehrer". If you want to split up the function of 2nd examiner please include this in your proposal about your committee which you send to dekanat (at) ma.tum.de. For example: 2nd examiner: Prof. A.B., University of C (review)/Prof. D.E., University of F. (oral examination). has to be someone who has not published together with you. In all cases the 3rd examiner can restrict herself/himself to writing a review without taking part in your oral examination. Please note that the department's quality assurance regulations do not allow for two of the listed persons (including the chairperson) to belong to the same M-Einheit. The chairperson doesn't have to be an expert on the dissertation subject, as s/he is concerned with the supervision of the doctoral examination process. How is the examining committee nominated? Please discuss with your supervisor the examining committee you want to propose to the faculty board. Your supervisor is asked to send this proposal to dekanat-at-ma.tum.de. It will then be discussed at the next faculty board meeting. The proposed members of the committee need to have agreed to act as examiners/reviewers for this doctoral project before you hand in the proposal. You will find your electronic application by selecting “My Progress” from the bar on the right. After that you will find the button marked “Submission of Dissertation” on the left side. Please make sure that you don't register a second time for the enrollment on the doctoral candidacy list, because this will imply legal consequences. 1. Group: You already know how to log into your DocGS account. 2. Group: If you are a voluntary member of a graduate center you already have an account, please log in. If you are not a member, you don’t have an account and have to create a new account. 3. Group: You don’t have an account and therefore you need to create a new account. If there occour any complications in DocGS, please contact docgs (at) zv.tum.de. To upload documents: You will find a list of documents needed and explanations in your account, in the register "documents". Please use the button "submit" if you are sure that you don't want to make any more changes. If you want to continue to work on your electronic application, don't forget to save your data. For a successful submission you will receive a green marker and an email. Group 1: After you have submitted your documents, your Graduate Center and TUM-GS will have to insert some data into doc-gs. After that you will be able to print your application form and hand in your paper application. Group 2: The Dean's Office and your Graduate Center have to enter data into your doc-gs account. After that, you will receive an email with your application form. Please be aware that this might take some time. You are welcome to inform the Dekanat in advance, of when you plan to submit your thesis, because otherwise there is a danger that the office will be is closed. The Dean's Office has to fill in data into your doc-gs account. Please be aware that this might take some time. You are welcome to inform the Dekanat in advance when you plan to submit your thesis, because otherwise there is a danger that the office is closed. Please print your application form and sign it. You are now able to work on your paper application. Please use only the application form which is generated by doc-gs to hand in your paper application at the doctoral examination office. Please note: To hand in your paper application at the doctoral examination office, you need to make an appointment. If you have a TUM diploma and transcript: please bring the originals with you when you hand in your dissertation at the examination office; they will be certified there. Persons from group 1 have handed in their diploma documents already with the application for the doctoral list, so they are not needed again. If you have a recognition of your foreign degree, please hand in the original instead of the foreign documents. work contract (not yet expired on the day you turn in your dissertation at the examination office); otherwise you need a certificate of good conduct (see "Preparation: Necessary Documents"). Application for a doctoral degree (submitting your dissertation): After you have handed in your application for a doctoral degree at the doctoral examination office, the faculty board will appoint the examining committee. Your supervisor is asked to send a proposal compatible with the Regulations for the Award of Doctoral Degrees at TUM, § 10 as an email to dekanat (at) ma.tum. Assessment of the dissertation: After the faculty board has appointed the examining committee, the head of the committee is responsible for all further proceedings: She or he will ask the examiners for written reports, and will then circulate the dissertation and the reports so that all persons eligible to vote for or against a dissertation in the department have the opportunity to assess it. If the dissertation is accepted, the head of the committee will schedule the oral examination in consultation with you as the candidate and the members of the examining committee and invite these persons to the oral examination. All members of the department have to be invited to your presentation by email. You have to take an oral examination that consists of first, a presentation about the subject of the dissertation that is open to the members of the department (30 minutes), and second, of questions after the talk from the authorized examiners of the department present afterwards (30 Minutes). This part is closed to the public. contact the TUM examination office (Ute Stinzel, +49 (0)89 289 22248) for official approval of your dissertation's title page. upload the electronic version of your dissertation at TUM library. have 6 copies of your dissertation's final version printed. After that you are entitled to receive your preliminary doctoral certificate at the TUM examination office. This document has the same legal functions as the final document. Graduation ceremony: The final doctoral certificate is awarded during the graduation ceremony of the Department of Mathematics, for which you will receive an invitation. For further questions please contact dekanat (at) ma.tum.de.